Glass Blocks make an attractive alternative to plaster, tile or metal finishes. 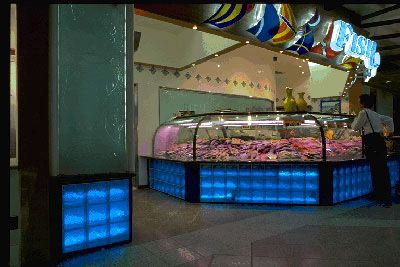 Glass Bricks can be in plain or coloured finishes, plain or textured finish, with artwork. Attractive options for your shop counter or wall. With BlokUp's patented curved wall system, you can design a wall that is interesting and easy to assemble. Achieve a beautiful curved glass wall with our exclusive framing and connectable radius clips. Create a stunning effect in a home entry or company foyer. The system also works well as a dividing wall for both residential rooms and offices.